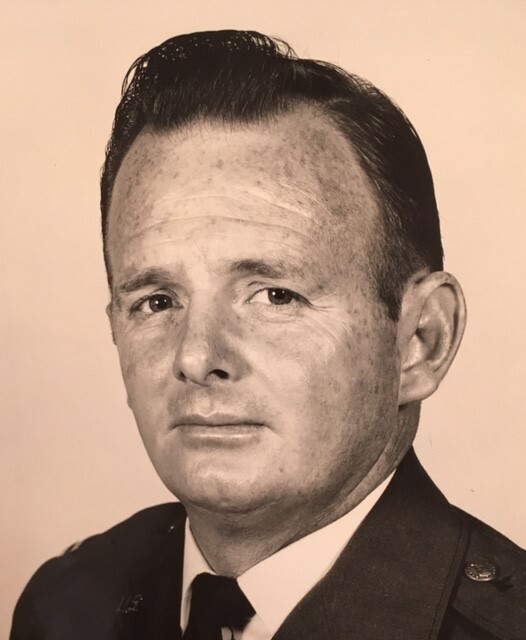 Richard Howard Timmerman, Major (Retired), United States Air Force, 85, of Fort Walton Beach, FL, passed away to be with the Lord on 17 November 2018, at his residence, surrounded by his loving family. He is survived by his wife of 59 years, Joyce Timmerman, daughter Lisa Roberts (Rick) of Davenport, FL, and daughter Leslie Timmerman of Crestview, FL, grandson Shawn Frady (Jessica), and great grandchildren Rilan Frady, Everly Frady, and Aubrey Borella. Richard enjoyed sports while at Boys Catholic High School in Augusta, GA, and was captain of the basketball team. “Timm” travelled the world with his family in the United States Air Force and was devoted to serving his country. An avid aviator, he had flown into over 60 countries, and he always looked forward to each mission, whether it was a rescue, a humanitarian, or the difficult ones serving in the Korean War and Viet Nam War. His dry wit and recollection of life experiences were always fascinating and entertaining to all. Timm’s Celebration of Life Service will be held 10:30 a.m.at Davis-Watkins Funeral Home, Fort Walton Beach, FL, on Tuesday, 11 December 2018. Burial Service will be at Barrancas National Cemetery in Pensacola, FL, at 1:30 p.m. In lieu of flowers, please consider a donation to Healing Paws for Warriors in his memory. Expressions of love and sympathy may be placed and viewed at www.daviswatkins.com.